Trading picked up on the Junior Market of the Jamaica Stock Exchange on Wednesday, resulting in an exchange of 3,107,329 units valued at $11,717,595 compared to 1,594,633 units valued at $6,823,033 on Tuesday. The market index dived 43.58 points to close at 3,077.63 as 26 securities changed hands with prices of 7 stocks rising, 10 declining and 9 remaining unchanged, compared with 23 securities changed hands previously. Trading ended with an average of 119,513 units for an average of $450,677 in contrast to 69,332 units for an average of $296,654 on Tuesday. The average volume and value for the month to date amounts to units 122,660 valued at $474,863 and previously 124,264 units valued at $487,194. 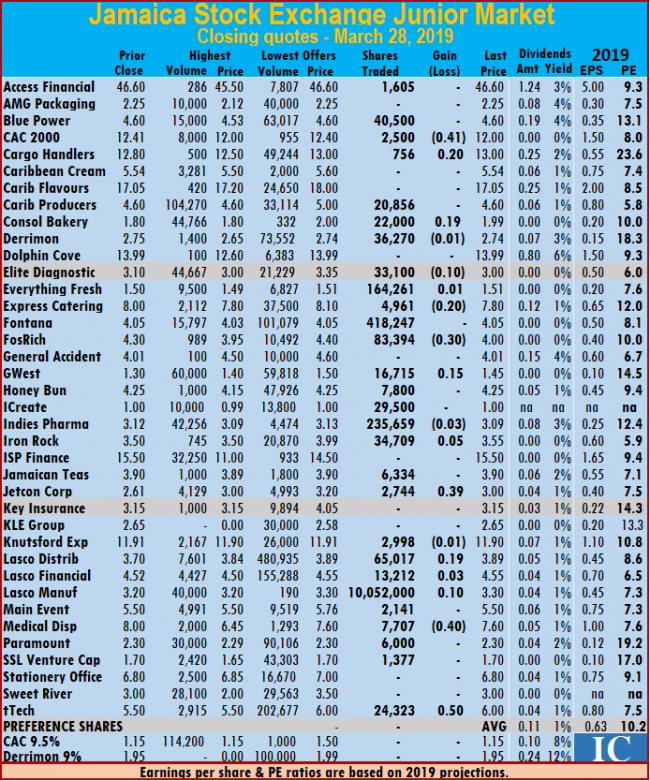 In contrast, March closed with an average of 195,942 shares valued at $777,498 for each security traded. IC bid-offer Indicator| At the end of trading, the Investor’s Choice bid-offer indicator reading shows 2 stocks ended with bids higher than their last selling prices and 3 with lower offers. 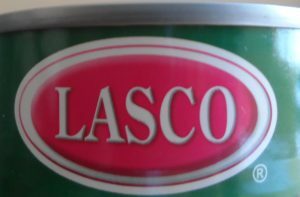 Lasco Distributors finished 2 cents higher at $3.72, with an exchange of 193,890 units. 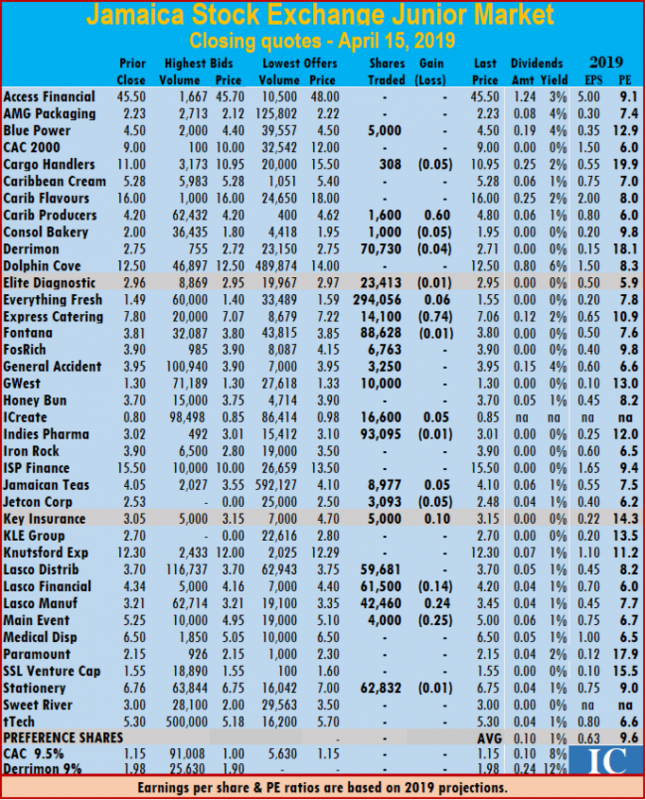 Lasco Financial traded 16,000 shares with a loss of 2 cents to end at $4.50, Lasco Manufacturing ended trading with a loss of 25 cents at $3.40, while exchanging 2,015,333 shares, Main Event traded 7,248 shares at $5.45, Paramount Trading closed at $2.50, with 100 units changing hands and Stationery and Office concluded trading with 103,830 shares at $6.75. 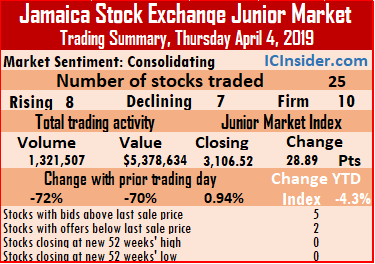 The Junior Market lost momentum on Tuesday with an exchange of 1,594,633 units at $6,823,033 compared to 4,742,829 units valued at $18,023,858 on Monday, as 23 securities changed hands, versus 28 previously. 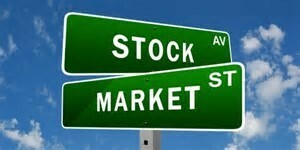 The market index slipped 7.23 points to 3,121.21 as the prices of 9 stocks rose, 7 declined and 7 remained unchanged. Trading ended with an average of 69,332 units for an average of $296,654 in contrast to 169,387 units for an average of $643,709 on Monday. 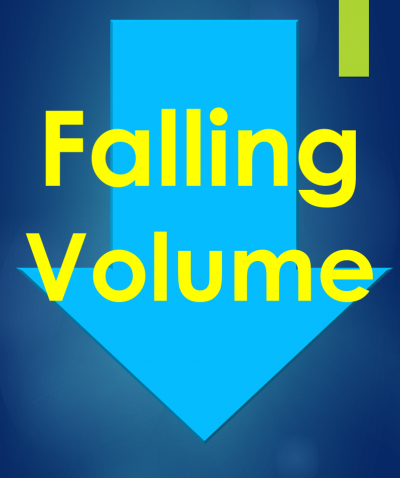 The average volume and value for the month to date amounts to units 124,264 valued at $487,194. 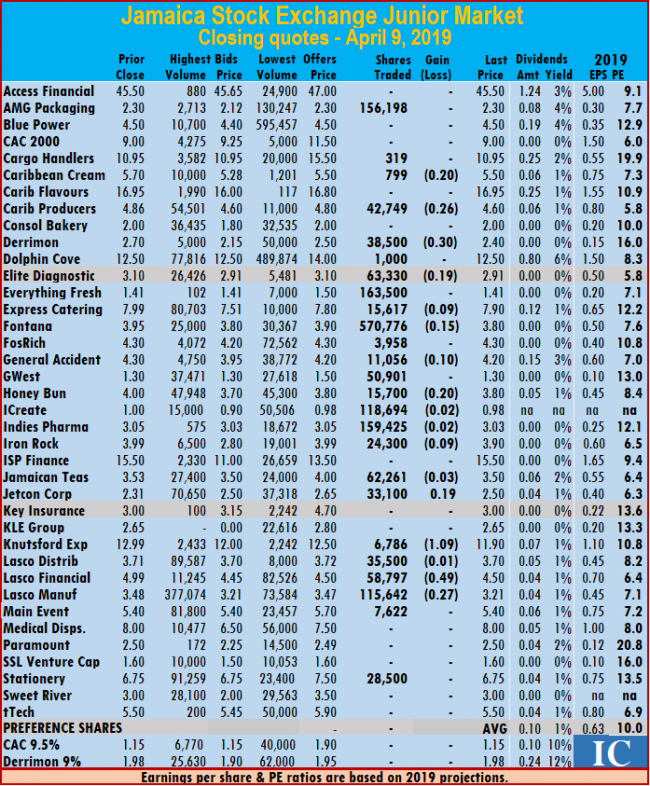 In contrast, March closed with an average of 195,942 shares valued at $777,498 for each security traded. 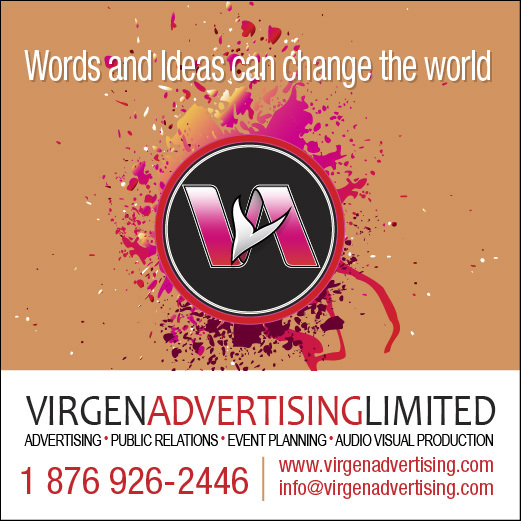 At the close of the market, Access Financial closed at $45.50, with an exchange of 7,807 shares, AMG Packaging ended 1 cent higher at $2.16, with 5,000 stock units changing hands, Blue Power concluded trading of 72,817 units, with a loss of 20 cents in closing at $4.30, Cargo Handlers settled at $11, in trading 1,500 shares. 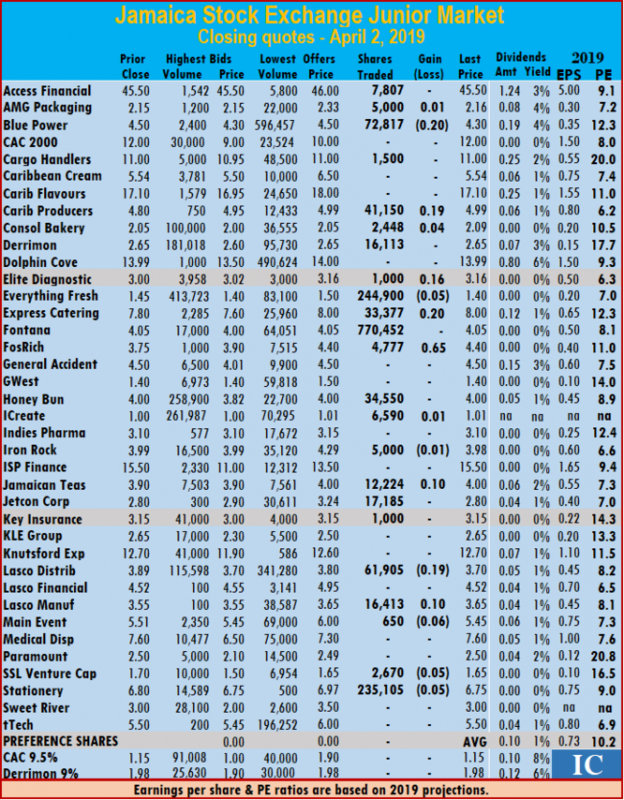 Caribbean Producers finished trading of 41,150 units with a rise of 19 cents to end $4.99, Consolidated Bakeries closed 4 cents higher at $2.09, with an exchange of 2,448 shares, Derrimon Trading ended at $2.65, with an exchange of 16,113 shares, Everything Fresh finished with a loss of 5 cents at $1.40, trading 244,900 stock units. Elite Diagnostic settled with a rise of 16 cents at $3.16, in trading 1,000 units, Express Catering swapped 33,377 shares after rising 20 cents higher at $8, FosRich Group traded 4,777 shares, in rising 65 cents higher to $4.40, Fontana finished trading at $4.05, with 770,452 shares, Honey Bun concluded trading at $4, with 34,550 shares. iCreate rose 1 cent to close at $1.01, with an exchange of 6,590 shares. 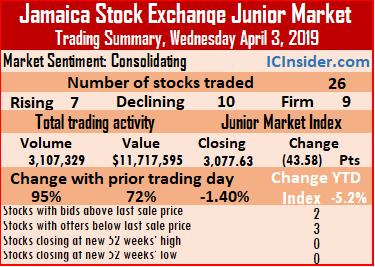 Iron Rock settled with a loss of 1 cent at $3.98, trading 5,000 shares, Jamaican Teas traded 12,224 units and rose 10 cents higher to $4, Jetcon Corporation traded 17,185 shares, at $2.80, Key Insurance closed at $3.15, with 1,000 shares changing hands. 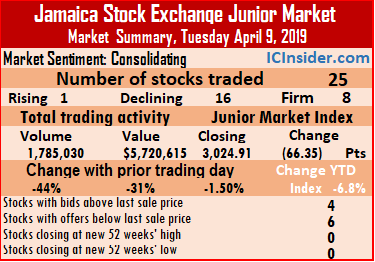 Lasco Distributors finished with a loss of 19 cents at $3.70, with an exchange of 61,905 units, Lasco Manufacturing ended trading with 16,413 shares and closed 10 cents higher at $3.65, Main Event traded with a loss of 6 cents at $5.45, with 650 shares crossing through the exchange. SSL Venture Capital ended with a loss of 5 cents at $1.65, with an exchange of 2,670 shares and Stationery and Office lost 5 cents to close at $6.75, with 235,105 shares changing hands. Fosrich traded 4 million shares on Monday. The Junior Market opened the second quarter positively in keeping with technical indicators suggesting that a major change in direction is coming soon with the market getting support from a triple bottom and wedge shape formation. 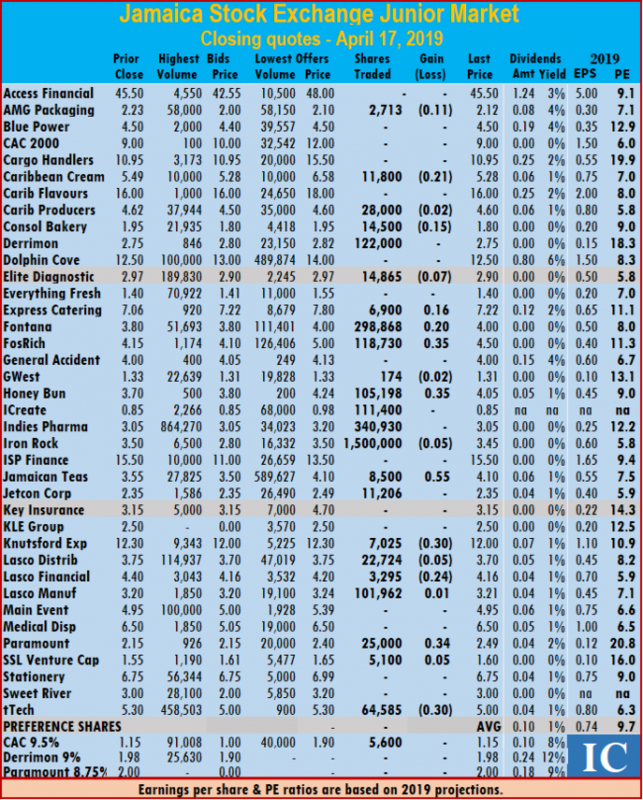 The market index jumped 36.42 points to 3,128.44 as the prices of 8 stocks rose, 10 declined and 10 remained unchanged. At the close of trading, 28 securities changed hands, versus 29 on Friday. 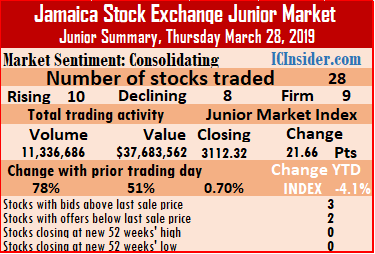 Market activities on Monday saw a 40 percent increase in the day’s volume to 4,742,829 units valued 18 percent higher at $18,023,858, compared to 3,378,621 units for $15,299,931 on Friday. The increase in trading was due to 4 million units of FosRich Group shares. Trading ended with an average of 169,387 units at $643,709 for each security traded, in contrast to 116,504 units at $527,584 on Friday. 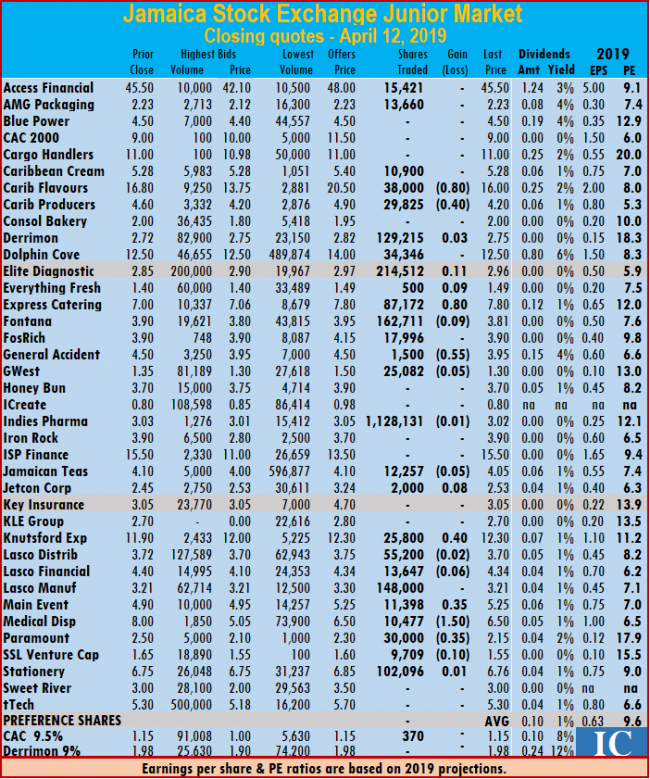 In contrast, March closed with an average of 195,942 shares valued at $777,498 for each security traded. IC bid-offer Indicator| At the end of trading, the Investor’s Choice bid-offer indicator reading shows 3 stocks ended with bids higher than their last selling prices and 7 with lower offers. 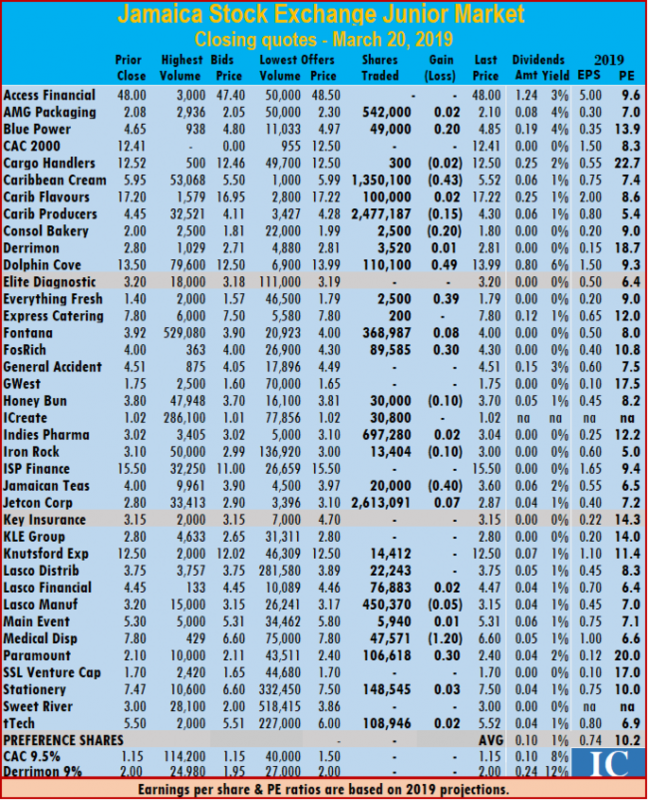 At the close of the market, Access Financial lost 50 cents to end at $45.50, exchanging 5,937 shares, AMG Packaging ended at $2.15, with 31,850 stock units changing hands, Blue Power traded 85,320 units with a loss of 10 cents at $4.50, Cargo Handlers fell 6 cents to close at $11, with an exchange of 22,000 shares. 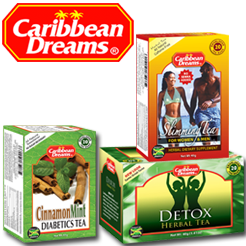 Caribbean Cream ended trading with 10,100 shares after falling 1 cent to close at $5.54, Caribbean Producers rose 3 cents to $4.80, trading 51,100 units, Consolidated Bakeries closed 6 cents higher at $2.05, with 50,000 shares changing hands, Derrimon Trading closed at $2.65, with an exchange of 5,800 shares, Dolphin Cove concluded trading with 1,369 shares at $13.99. Everything Fresh finished with a loss of 6 cents at $1.45, with 109,500 stock units changing hands, Elite Diagnostic settled at $3, with 5,400 units crossing through the exchange, Express Catering ended trading of 900 shares 20 cents higher at $7.80, FosRich Group traded 4,014,634 shares with a loss of 25 cents at $3.75. 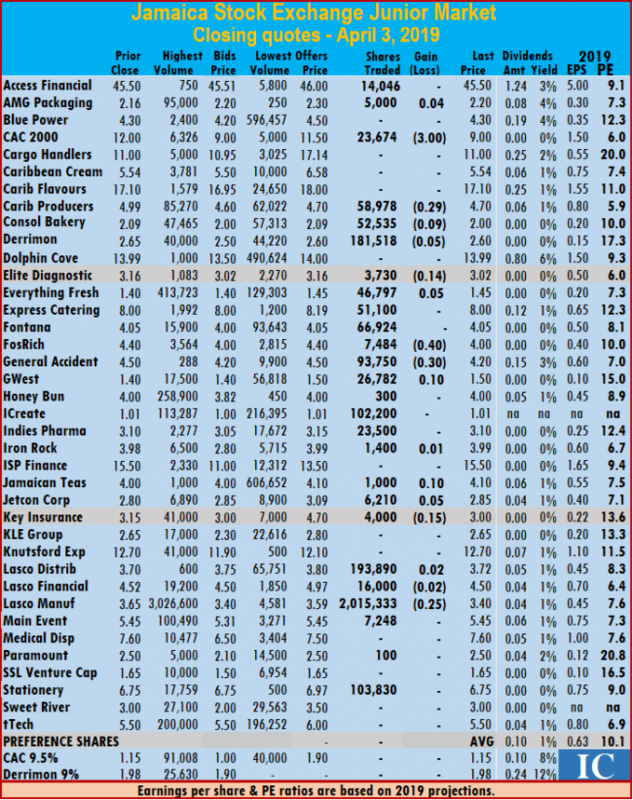 Fontana finished trading of 110,105 shares, at $4.05, General Accident closed at $4.50, with 100 stock units changing hands, Honey Bun ended trading of 9,197 shares, with a loss of 24 cents at $4, iCreate shed 1 cent to close at $1, with an exchange of 29,530 shares. 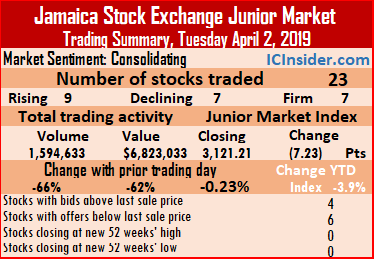 Indies Pharma finished 1 cent higher at $3.10, with an exchange of 16,923 shares, Jamaican Teas traded 12,654 units to close at $3.90, Jetcon Corporation finished trading with 1,950 shares at $2.80, Lasco Distributors finished 4 cents higher at $3.89, with 51,810 units changing hands, Lasco Financial settled 2 cents higher at $4.52, in exchanging 100 shares. Lasco Manufacturing ended trading of 7,000 shares with a loss of 5 cents at $3.55, Main Event traded 55,300 shares at $5.51, Paramount Trading closed 20 cents higher at $2.50, with 1,000 units changing hands. Stationery and Office concluded trading with 8,250 shares at $6.80 and tTech settled with a loss of 50 cents at $5.50, with an exchange of 15,000 stock units. 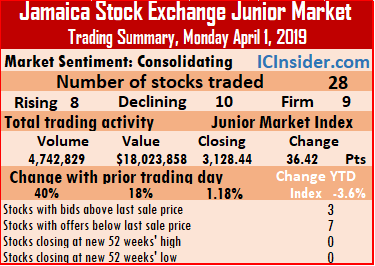 In the junior market preference segment, Derrimon Trading 9% ended 3 cents higher at $1.98, with 30,000 stock units changing hands. 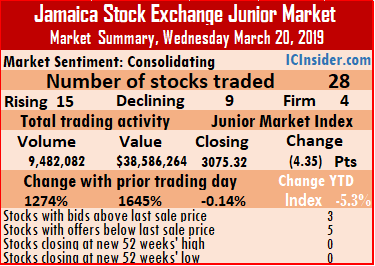 Lasco Manufacturing traded 10 million shares on Junior Market on Thursday, accounting for 89 percent of the day’s volume that saw 11,336,686 units changing hands at $37,683,562, compared to 6,366,628 units valued at $24,922,045, changing hands on Wednesday. At the close of trading, 28 securities changed hands, the same as Wednesday. The market index rose 21.66 points to close at 3,112.32 as the prices of 10 securities rose, 8 declined and 7 remained unchanged. Trading ended with an average of 404,882 units for an average of $1,345,842 in contrast to 227,380 units for an average of $890,073 on Wednesday. 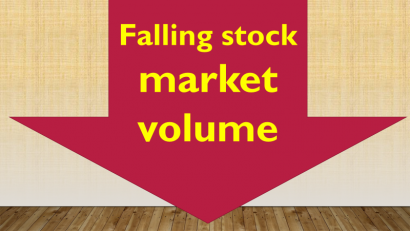 The average volume and value for the month to date amounts to 200,568 shares valued at $792,051 compared to 188,396 shares valued at $759,059 on the previous day. 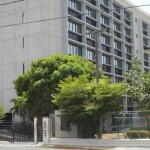 In contrast, February closed with an average of 235,225 units valued at $679,790 for each security traded. IC bid-offer Indicator| At the end of trading, the Investor’s Choice bid-offer indicator reading shows 3 stocks ended with bids higher than their last selling prices and 2 with lower offers. 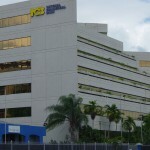 At the close of the market, Access Financial closed at $46.60, with 1,605 shares changing hands, Blue Power concluded trading of 40,500 units, at $4.60, CAC 2000 finished with a loss of 41 cents at $12, with an exchange of 2,500 shares, Cargo Handlers settled 20 cents higher at $13, with the trading of 756 shares. 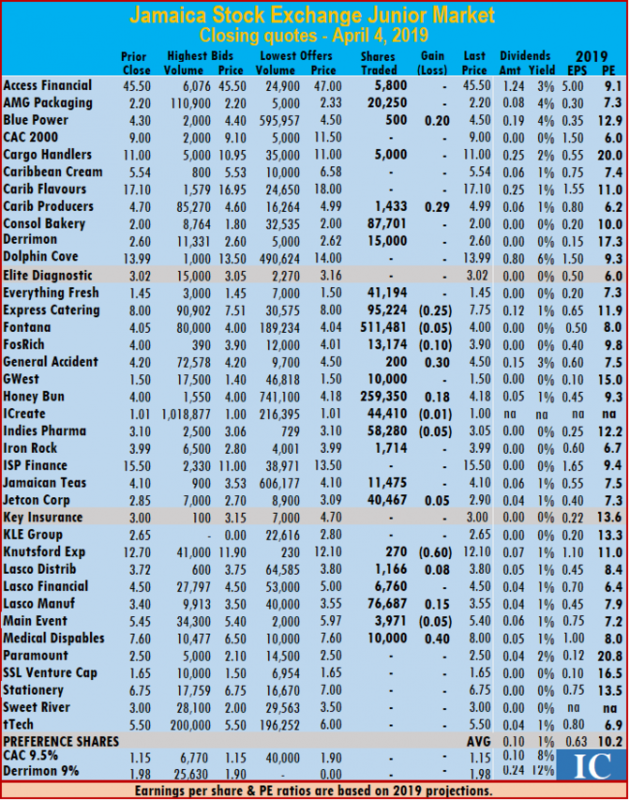 Caribbean Producers finished trading 20,856 units at $4.60, Consolidated Bakeries closed 19 cents higher at $1.99, with 22,000 shares changing hands, Derrimon Trading ended with a loss of 1 cent at $2.74, exchanging 36,270 shares, Everything Fresh gained 1 cent in closing at $1.51, trading 164,261 stock units. Elite Diagnostic settled with a loss of 10 cents at $3, with an exchange of 33,100 units, Express Catering ended trading with 4,961 shares after a loss of 20 cents at $7.80, FosRich Group traded with a loss of 30 cents at $4, with 83,394 shares changing hands, Fontana finished trading 418,247 shares, at $4.05. 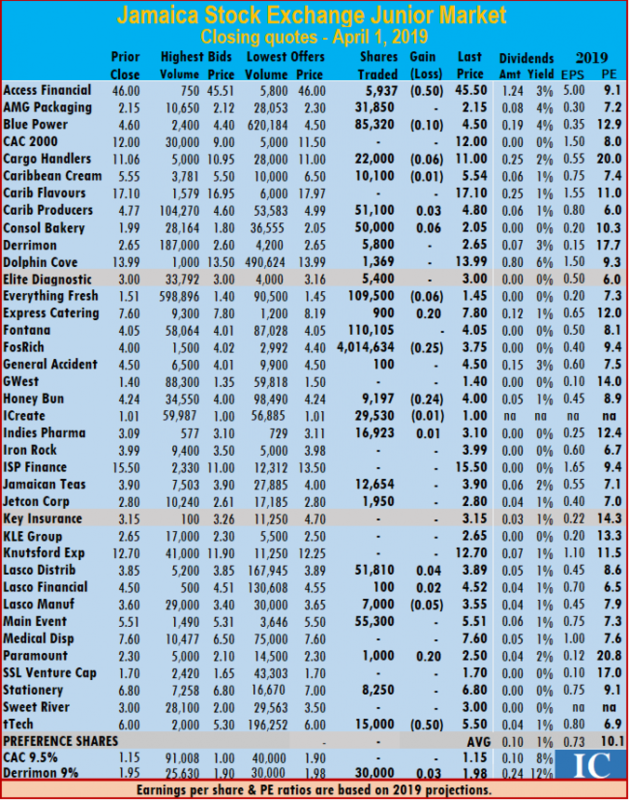 GWest Corporation ended 15 cents higher at $1.45, in trading 16,715 units, Honey Bun traded 7,800 shares at $4.25, iCreate closed at $1, with an exchange of 29,500 shares, Indies Pharma finished with a loss of 3 cents at $3.09, with 235,659 shares changing hands, Iron Rock settled 5 cents higher at $3.55, with an exchange of 34,709 shares. 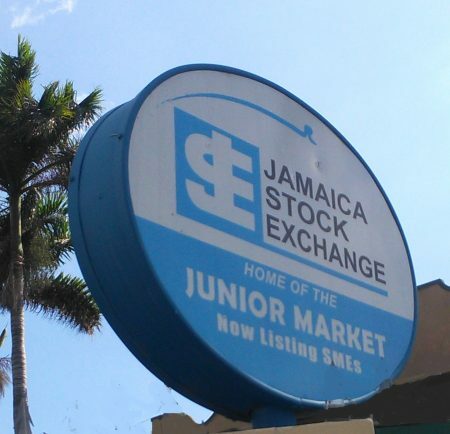 Jamaican Teas traded just 6,334 units at $3.90, Jetcon Corporation finished trading 2,744 shares, for a rise of 39 cents to $3, Knutsford Express fell 1 cent in closing at $11.90, with 2,998 stock units crossing through the exchange, Lasco Distributors finished 19 cents higher at $3.89, with 65,017 units changing hands. Lasco Financial settled 3 cents higher at $4.55, exchanging 13,212 shares. Lasco Manufacturing ended trading with 10,052,000 shares and rose 10 cents to $3.30, Main Event traded 2,141 shares at $5.50, Medical Disposables finished trading with a loss of 40 cents at $7.60, with the swapping of 7,707 stock units. Paramount Trading closed at $2.30, with 6,000 units changing hands, SSL Venture Capital ended at $1.70, with an exchange of 1,377 shares and tTech settled 50 cents higher at $6, as 24,323 stock units changed hands.